Terrible rebound to give up, and seconds into the game no less. Pretty sure selling out to try poke checking a right-handed shooter on the right side with no angle is not how the goalie coaches are teaching this scenario. Maybe he thought it was going wide? Puzzling at the least not to respond to an unscreened shot on net from that far out until it was safely in the goal behind him. Another brutally bad rebound to give up. Luckily for the Pens, Dubinsky shot the next egregiously bad rebound off Fleury's mask, and they were able to overcome for the victory. Another right-handed shooter coming down the right side with a bad angle. Gaping 5-hole and cheating on the cross ice pass and the Blue Jackets have another on the board. If a goaltender hasn't gotten his rebound control under wraps by his 13th season in the league, chances are it's never going to happen. After scoring two unanswered goals to cut the deficit to 1, the Penguins needed a big push in the 3rd period. Either quitting on the play or lazily getting back into position, depending on how generous you want to be, but clearly not the effort the team was looking for. Sure, the defensemen deserve some blame on the latter half of this play, but it's impossible to ignore how far out of his net Fleury came before bumbling the puck away in a position where the Blue Jackets could put it into the empty net. The Penguins did not have their best two game stretch, as both the forwards and the defense were sloppy with the puck, but they received little help from the guy in net. As good as Marc-Andre Fleury performed in the first two games, he was equally as bad in the last two. 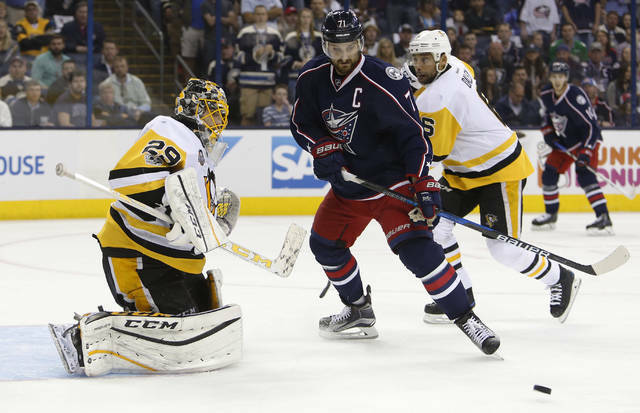 The team is lucky to have split the games in Columbus based on that showing, and hopefully Fleury left his goaltending skills in Pittsburgh so they're there waiting for him for Game 5. Somehow, the worse Fleury performs, the louder people want to shout that there's not a problem. It's okay to admit that he hasn't been good. It's okay to admit that he hasn't been good. It's okay to admit that he hasn't been good. You might not win "Homer of the Year", but it'll help you sound like a more intelligent and knowledgeable fan. The Penguins still hold a commanding lead in the series, but they will need to be better in net, on defense, with the puck, take your pick; otherwise they will have difficulty making another deep postseason run. One pressing question remains for that to happen: Is Matt Murray healthy yet?